Set the timer! Sixty seconds to sell your home. When buyers are property perusing, the first minute of a potential home viewing is imperative. An initial positive sixty seconds puts them into a great frame of mind, where as if they pick fault in those vital moments, chances are they won’t be signing on any dotted lines. A good first impression will make your viewer want to live in your home, and that’s what you need to establish in those first moments. Maintenance – How’s that broken light fitting in the hall, are the wires still dangling from the ceiling? A minor five minute job for you can lose you a sale. Showing a lazy attitude to your general DIY before a house viewing, can leave people deflated and wondering what else you might not have fixed, especially things that can’t be seen. Complete all repairs in the house before you have people over. Cleaning – You may have enjoyed your eggs on toast this morning, but the buyers won’t enjoy the pots on the table, or the leftover smell. It may seem like a minor detail, but if it’s one of the first things they see, it’ll leave an impression. Do the dishes and make your kitchen shine. Hoover and dust each corner and crevice of your home to perfection, wash the windows, and make people want to live there. 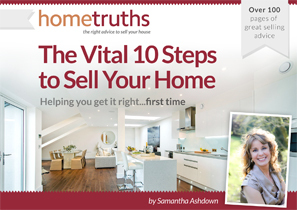 Clutter – De-cluttering is vital for the first minute of a property viewing. If buyers walk in to a hall or living room that is full to bursting, it makes rooms look smaller and your home immediately feels chaotic. To envision themselves living there, buyers need clear open spaces to picture where their belongings and furniture can go, and it’s hard to imagine this with piles of stuff in their line of vision. If you have a lot of clutter, spend a weekend sorting it out. If it’s easier, store things at a friend’s house, although throwing out things you don’t need now will save you time when you move. Smells – Just like the eggs example, any lingering smells will hit buyer’s noses instantly. Open the windows (weather permitting!) to let fresh air into your rooms. Put any pets outside or ask someone to look after them. Create a nice smell for the air, such as baking. Read about smells in your home in more detail here. Colours – Even if you love your very darkly painted entrance room, heading into a dark room could give a bad first impression. Research has shown that a lot of buyers prefer natural colours such as magnolia, and this is a sensible choice for a hallway. Heading into a light and bright room, works wonders. If you want to create the right first impression with your buyers and generate a positive viewing, the points above are crucial to pay attention to. If a sale can be generated from a few hours of work, it will be worth it when you are shaking hands with the agents for your property. What to read next: Time to Sell?